Riding the train to school. Photo by Ana Radonjic. You always think it is going to be a simple commute: 25 minutes, nine stops, six blocks, one train. You’ll get a seat, mind your own business, and go unbothered until you reach your destination. However, my commute is rarely like this. I rush out of my building and up the long, treacherous hill. Every step gets more difficult, as I feel the weight of my book bag. These are the moments when I curse my parents for not forcing me to go into sports. Despite this, I always reach the top and go into the train station around the corner feeling victorious. The huge crowd of teenagers leaving the station to get to their own high schools always makes this difficult. I push my way through and finally get to the turnstile. As I swipe my metro card, I pray that it won’t read the words “Swipe card again.” Thankfully, this doesn’t happen often. I’m back to rushing, and this time down the stairs and all the way from where the back of the train stops to the front. No matter the weather, I begin to sweat while waiting. I pass by the same two homeless men every morning, wondering how they got here, where their family is, and if they’re hungry. I hold my breath, feeling terrible that I feel the need to do so, as do the many others passing by. Continuing my walk, I stop at the same pillar every morning. This pillar marks the perfect spot. This is where the train doors stop perfectly in front of me, and the point on the train that will leave me right by the exit when I get to the Steinway Street station. From my walk to the station, to actually sitting on the train, I see and experience many memorable things. Every day I feel like I see something I’m not supposed to: A private, honest moment between people. People in love, people in hate, people in sync, and people so out of sync that you barely even notice they’re traveling together. The old Asian woman rushing with her husband to get on the train is just one. She gets on right after me, but stands in between the doors, hunched over, and holding them open. Her husband slowly makes his way down the stairs, with his cane, and the doors begin to close, but she doesn’t let go. You can see him struggling to try and speed up, but his wife will not leave without him, and they definitely will not wait for another train. She pushes the doors that begin to close back open, as her husband gets on in the last seconds. They sit down together exhausted, and intertwine their fingers. They made me realize how simple actions, like this one, can mean so much to the person you love. There’s a younger couple, quietly arguing, trying not to disturb the ones around them. They never let go of the each other’s hands, and they never lose eye contact. Out of nowhere, they both stop. They apologize at the exact same time and share a quick kiss. The girl leans her head on her partner, and they both exhale and close their eyes. I too, exhale at this moment, thankful that they seemed to have gotten over their argument. 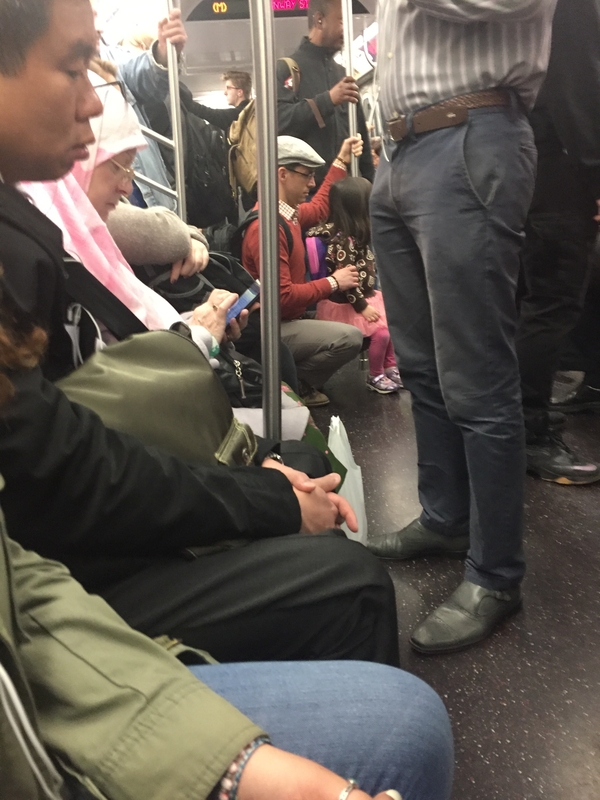 Another thoughtful moment, when a man dressed in a business suit squats in the middle of a full train with no available seats, his daughter in his lap. His daughter in a hot pink tutu, with a matching book bag, constantly giggling and hugging him, brings light into my gloomy morning. And a woman with her child in the stroller who sits down exhausted in the train seat. She pulls out two textbooks and begins to read with one hand while rubbing her baby’s stomach with the other. Her determination and ability to multitask makes me feel inspired. As I see these moments, I wonder how many people have noticed mine? How many people have seen me frantically trying to study, or running onto the train as the doors closed? How many people have seen me laughing so hard with my friends that I can’t breath?How many people have seen me slowly fall asleep, before jerking awake, and running off the train in the last possible moment? How many other people actually look up from their phones, and observe the people around them? My commute, simple yet intricate, is one I wouldn’t trade for the luxury of being dropped off at school. Seeing these moments make my mornings what they are. They make me realize that everyone is trying to get somewhere, too and that there are endless amounts of things to smile about in the world around you. ← Is Being Driven to School Really a Luxury?